Apologia Educational Ministries, Inc. is proud to present the second edition of its Exploring Creation With Biology course. The first edition has been used by thousands of students in all 50 states and 13 other countries. Now, this award-winning biology course will get even better! 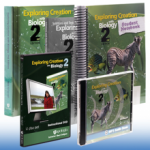 The Biology SuperSet includes five items from Apologia’s Exploring Creation with Biology product line: the textbook, tests & solutions manual, student notebook, MP3 audio CD, and video instruction DVD. This high-quality spiral-bound notebook is specifically designed to help your student make a successful transition to high school science. This homeschool resource will help them feel accomplished and be more indpendent, organized, and prepared. The notebook contains a daily schedule, note-taking pages, and instruction in the Cornell note-taking system. There’s also space to answer all study questions found in the textbook. Lab report forms for each experiment in the text will help your student master the process of writing a complete lab report, and included illustrations, that are not found in the textbook, will ensure that they are indeed learning all that they can from their labs. Additionally, a “Design Your Own Experiment” section walks students through the steps involved in designing and conducting their own experiments! Audiobook version of Exploring Creation with Biology, Apologia's award-winning, college-prep biology course that provides a detailed introduction to the methods and concepts of general biology. This CD contains a complete audio recording of the course Exploring Creation With Biology, Second Edition as read by Kathleen Wile. Although the audio for the complete text and “On Your Own” problems is included on the CD, the audio for the study guides, tests, and answers is not included. This is the perfect accompaniment to the book for students who are auditory learners, slow readers, or have other learning disabilities that make reading difficult. NOTE: To use this disc, you must have a DVD drive on your computer and a program capable of playing .mp4 files. Want to make biology a blast for your student but you don’t know a polysaccharide from a protozoan? Enhance your student’s education with this outstanding instructional DVD featuring Apologia author and marine biologist Sherri Seligson. On-location footage takes your student all over the United States and to exotic locales such as the Caribbean and Iceland. Featuring more than twenty hours of instruction, this four-disc DVD also contains PowerPoint lectures and video presentations of every experiment from the textbook.